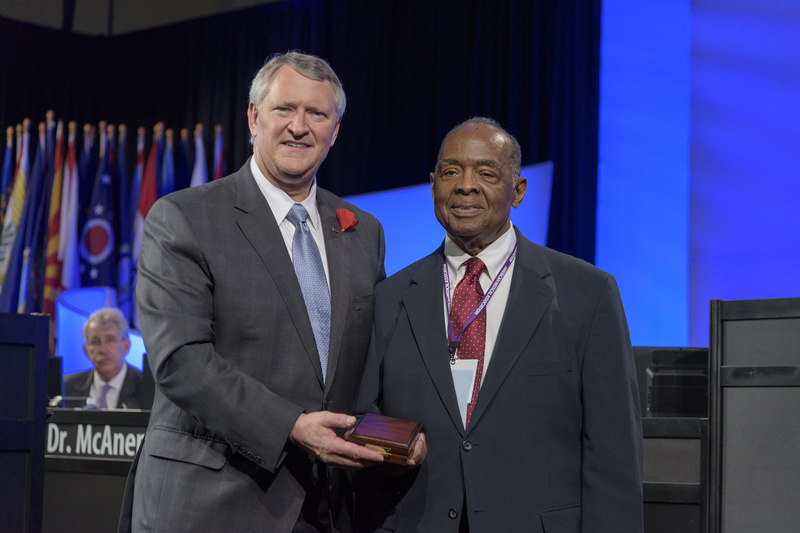 AMA President Dr. David O. Barbe, left, presents the AMA Medal of Valor to MAFP member Dr. Robert Smith of Jackson. Dr. Robert Smith, MD, of Jackson, was honored in November with the American Medical Association’s Medal of Valor Award at its 2017 Interim Meeting in Honolulu, Hawaii. The award honors AMA members who demonstrate courage under extraordinary circumstances in non-wartime situations. Dr. Smith was an instrumental figure during the civil rights movement in Mississippi, providing consistent health care to those with little or no access. A founder of the Medical Committee for Civil Rights and the Committee for Human Rights in the mid-1960’s, Dr. Smith and other health care professionals aided and treated civil rights workers and many other Mississippians during the Freedom Summer of 1964. Dr. Smith co-authored, founded and implemented the concept of Federally Qualified Health Centers. He co-founded the nation’s first rural community health center, Delta Health Center, in Mound Bayou, as well as the Mississippi Primary Health Care Association (MPHCA), which provides accessible and affordable primary medical care and dental care services to individuals and families. There are now more than 10,000 centers serving 30 million Americans, including several hundred thousand Mississippians. A native of Terry and a graduate of Tougaloo College, Dr. Smith received his medical degree from Howard Medical School and serves as president and chief executive officer of Central Mississippi Health Services, Inc., He and his wife, Dr. Otrie H. Smith, have three children.